What Makes It Really Spring? Scientifically speaking, the first day of spring is the vernal equinox, when day and night are of equal length. However, a naturalist may have a more personal definition. For some, spring officially starts when the streaky red hoods of skunk cabbage poke out of a bog. For others, it’s when catkins of bloom dangle from birches, or when chimes of spring peepers ring out, or when bluebells adorn moist woodlands. 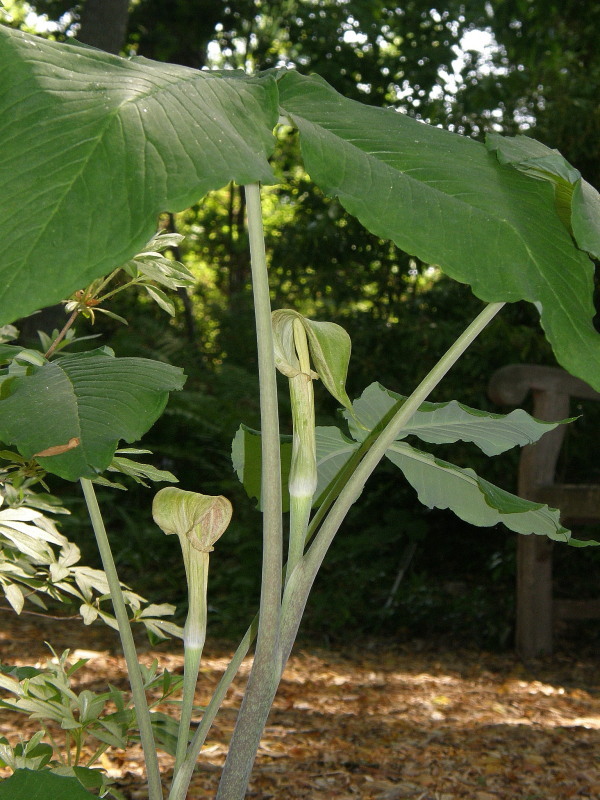 I’ve sometimes declared it to be spring when I found my first Jack-in-the-pulpits, or a jaunty display of Dutchmen’s breeches, or the pristine white petals of bloodroot. For many birders, though, Official Spring is marked by the return of an eagerly awaited avian migrant. When a special bird reappears, we feel that the great cycle of life is continuing as it should. And if the birds fulfill their promise to come back, surely we have an added chance at life, too. Some people claim that the essential requirement for spring is hearing the high-pitched twitters of a woodcock’s wings in courtship flight. That doesn’t work for me; woodcocks are too hard to find these days. I want my spring guaranteed. My friend Diane declares that it’s not spring until she hears or sees a Louisiana waterthrush. One April day when I was at Paint Branch, I heard the sharp call notes of that very bird. The waterthrush song always makes me smile, with its three slurred “now hear this” introductory notes followed by a mix of conversational phrases. The bird was investigating a boggy area near the creek. He lifted to a tree near me, threw back his stripy head, and sang and sang. Okay, I conceded, who could doubt that it was spring? Naturally, we all celebrate the return of Eastern phoebes with their bobbing tails and quirky voices; yellow-breasted chats whose eccentric vocalizations issue invisibly from thickets; and Baltimore orioles, fiery bright, tossing melodies from the treetops. Their renewed presence, their music and beauty mean so much after a cold dark winter. One April when I was at Great Falls, my heart knew it was spring when I saw that the eagle’s nest on Conn Island seemed safe from failure. A majestic parent eagle stood on the huge nest feeding a small dark downy fledgling. The youngster gobbled the parent’s offerings, then struggled over to the high rim of the nest, rested its head as if on a pillow, and went to sleep. The parent, with white head up and yellow eyes watchful, stood guard, while the little one napped in the warm spring sun. In some years, I’m likely to say spring has arrived with the first sibilant song of a blue-gray gnatcatcher. I love to watch these little bright-eyed charmers as they flit about, flashing their long white-edged tails. They further endear themselves to me by using the orange bud-scales of beeches, my favorite trees, when they build their small round nests. On an April day when I head for Rock Creek, a day when it’s warm and not windy, bright with sun and a descant of bird song, it’s hard to say which first-of-season bird embodies the true beginning of spring. I can’t choose among delightful options: a northern parula with those over-the-top buzzy notes coming from his brilliant yellow throat, a white-eyed vireo caroling a series of “Chick bury-o chick” songs atop a multiflora rose tangle, and a silent palm warbler with that constantly pumping tail. As you can see, the bird that “makes it spring” for me is a variable consequence of mood and serendipity. There’s no rule. Rightness is all. Sometimes spring clicks into place for me in an unexpected but thoroughly satisfying way. One early April day while I was in our woods engaged in the ongoing battle with garlic mustard and honeysuckle, I heard a familiar, lively song. I laughed with pleasure. 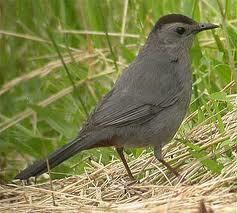 It was our first spring catbird! I hadn’t realized how much I’d missed him. Dapper in his gray suit and black cap, he sang cheerful encouragement while I pulled up invasive plants. Then a downy woodpecker complained about our empty suet feeder, so I lugged my bagful of weeds to the garage and brought out some suet. The little downy hung back. The first bird to enjoy the feast was my blithe companion, the catbird. Happy Spring, Cecily! I, too, think it’s spring the minute I hear the birds sing. My dear friend, Cecily, wrote this lovely piece about what makes it spring. With the weather here in the DC area having gone from summer temperatures, to snow, to light jacket weather, to frost this morning, I really needed a refresher on how to spot it. Thanks, Cecily, for your lovely post!